(Irvine, California) February 8, 2016— The national sales company for Hi-Chew has launched an all-new line of candy called Hi-Chew Sours. Morinaga America is now taking orders for Lemon, Lime and Grapefruit Sours in a mixed peg bag, and plans to follow up with more new products in coming months. Hi-Chew has long been the best-selling chewy candy in Japan, and is highly successful throughout the rest of Asia. In recent years, the original Hi-Chew has enjoyed unusually strong sales success in the American market, inspiring top convenience store distributor Harold Levinson Associates (HLA) to honor Morinaga America as “Confectionery Vendor of the Year 2015.” The new Sours version seeks to address demand from a broader set of customers in the rapidly evolving U.S. market. The introduction of Hi-Chew Sours follows the recent launch of a larger new package of original Hi-Chew. That 14.1-ounce bag is the first product from Morinaga’s new North Carolina production facility. Original Hi-Chew is also offered in 3.53-ounce peg bags, and 1.76-ounce sticks. Hi-Chew Sours are initially being offered in a new 3.17-ounce peg bag, and according to Moling, more new product announcements will follow in the near future. The history of Hi-Chew stretches back over a century, when company founder Taichiro Morinaga brought candy-making skills to Japan from America in the 1800s. Hi-Chew has long been the #1 soft candy in Japan, and in recent years, has also become a hit in the rest of Asia and America, especially among the young. In the U.S., original Hi-Chew is offered in Strawberry, Green Apple, Mango, Grape, Cherry, Banana, Melon, and Kiwi. 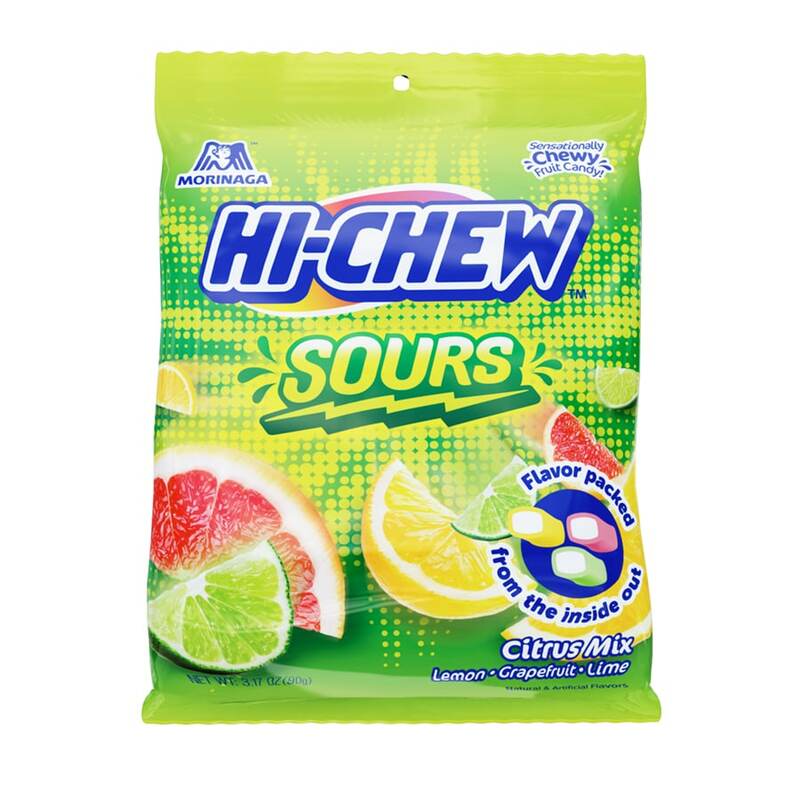 The Hi-Chew Sours come in Lemon, Lime and Grapefruit. Hi-Chew Bites are offered in Grape, Strawberry, Mango, and Orange and are made with real fruit juice blended into the chewy candy, which is 100% free cholesterol or artificial colors.